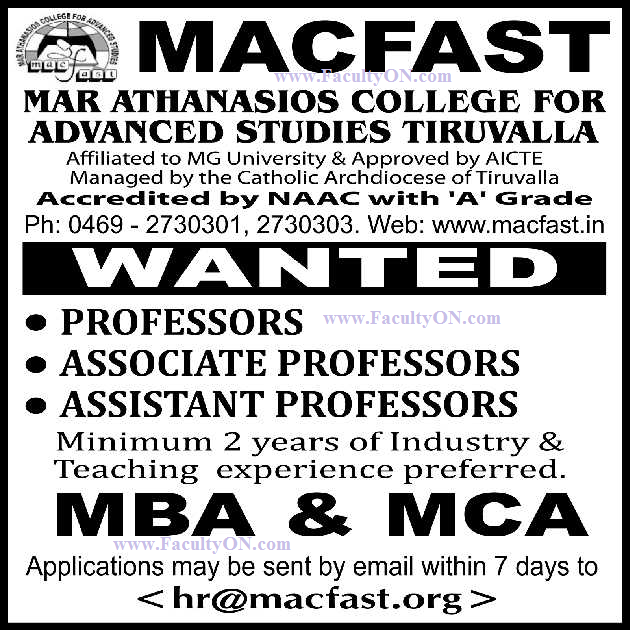 Mar Athanasios College for Advanced Studies, Tiruvalla has advertised in THE HINDU Opportunities newspaper for the recruitment of Teaching Faculty- Professor / Associate Professor / Assistant Professor jobs vacancies. Interested and eligible job aspirants are requested to apply within 07 days from 15th November 2017. Check out further more details below. About College: Mar Athanasios College for Advanced Studies Tiruvalla (MACFAST), Kerala, India, a post graduate and research institution, was started in 2001, with the objective of offering specially designed courses in Business Management, InformationTechnology and Biosciences. MACFAST is owned and managed by the Corporate Educational Agency of the Catholic Archdiocese of Tiruvalla, with His Grace Dr. Thomas Mar Koorilos as the President and Patron. In the past 76 years this agency has contributed to the establishment of a large number of schools, colleges, hospitals, medical and paramedical institutions throughout the country. MACFAST is located in the commercially active town of Tiruvalla, Kerala. Amidst the lush green, stands this multi-storeyed building with a built-up area of 3,00,000 sq. ft.